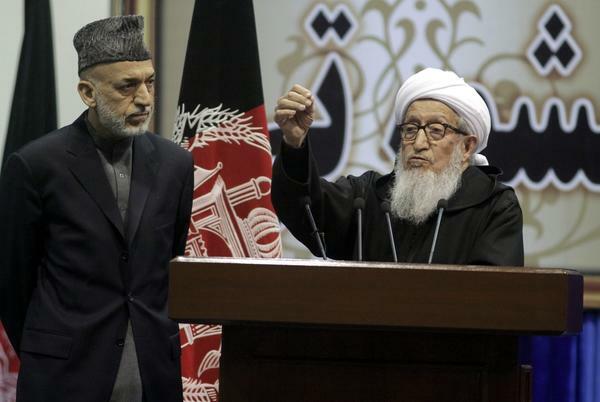 KABUL, Afghanistan (AP) — Afghanistan’s first president following the withdrawal of Soviet troops from the country and the collapse in 1992 of Kabul’s pro-communist government, Sibghatullah Mojaddedi, has died. He was 93. The white-turbaned and soft-spoken Mojaddedi was a mentor to former President Hamid Karzai, who had belonged to his anti-communist resistance group during the 1980′s Soviet invasion of Afghanistan. Mojaddedi’s guerrilla group — the US-backed Afghan National Liberation Front — was perhaps the smallest and most moderate of guerrilla groups fighting to oust the former Red Army from Afghanistan. Following the collapse of the communist government, Mojaddedi in 1992 served for two months as Afghanistan’s president in line with an agreement signed in Mecca, Saudi Arabia, by the leaders of all the mujahedeen groups who had fought the former Soviet Union. Mojaddedi stepped down as he said he would, according to the agreement, but his successor, Burhanuddin Rabbani, who was to serve for four months, instead hung on to power for four years. The agreement broke down and a brutal war between rival mujahedeen groups engulfed the Afghan capital of Kabul, killing tens of thousands of mostly civilians until the Taliban took power in 1996. During the Taliban rule, Mojaddedi lived outside of Afghanistan and returned to the country following the US-led invasion in 2001 that drove the Taliban from power. He served as head of the first post-Taliban Loya Jirga, the 2,500-member council of elders or “grand gathering” that eventually crafted Afghanistan’s current constitution. An ethnic Pashtun from Kabul, Mojaddedi came from a deeply respected religious family, who often advised former Afghan kings on matters of religion.